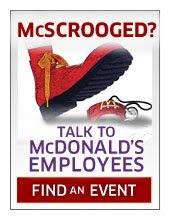 Brother Jesse Blog: McDonald's Opposes Employee Free Choice Act: Will Workers Speak Out? McDonald's Opposes Employee Free Choice Act: Will Workers Speak Out? I was searching on the SEIU.org website today, after reading about the historic groundbreaking of the workers health clinic in Houston. I came across an interesting campaign being lead by SEIU, which happens to be the fastest growing union in the Americas with 2 million members in Canada, the United States and Puerto Rico. The campaign is aimed at fast food giant McDonald's,which is reportedly opposing the Employee Free Choice Act. In other words they are against their employees having a voice. McDonald's has reportedly even formed an "internal response team...to actively participate in the opposition to the Employee Free Choice Act." They have also ran ads opposing the act along with with other major business entities. Why is this Act important? SEIU says, the Employee Free Choice Act gives workers the free choice to join unions so they can negotiate for better wages, benefits, and retirement security. According to the group, people who join unions earn 30% higher wages and are 59% more likely to have health insurance. McDonald's has more than 600,000 employees in the US, many of whom earn less than $8.11/hour. That's not surprising of course. I have former students who work there. Neither is it surprising that the CEO of "Mickey D's" took home a mere $13 million in 2007. That's $6,250 per hour. It's clear that they want to keep it that way and make sure their employees stay focused on flipping burgers rather than standing up for themselves. According to SEIU organizers, Congress is considering the Employee Free Choice Act—bipartisan federal legislation. But McDonald’s and other corporations are spending big money to oppose it. The SEIU is calling on people across the country to take a stand by asking if they can take an hour on Thursday, December 19 to go to their local McDonald's to educate McDonald's employees about free choice.